It seems that there's many times where a goalie often gets lost in the shuffle and will get bounced around, not because he's not good enough, but because he just didn't fit the needs of the team. This week, we have a guy who had solid footing in net, but because he didn't have the best team around him and got there at the wrong time-- he was slighted. This week, the career of Mike Veisor. Veisor's trek to the NHL started in Junior "A" with the Hamilton Red Wings, playing in 96 games with no record on record because it seems they didn't like to keep them up to date back in 1969 through 1971. Veisor then moved onto playing with the Peterborough Petes for the 1971-72 season, playing in 49 games (again, no record there) and helping the Petes win the OHA, going 11-2-2 in the playofs; then going 2-1 in the Memorial Cup, where the Petes would lose the Cornwall Royals in the Final. 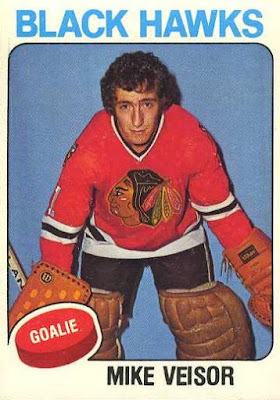 Following his performance, the Chicago Blackhawks selected Veisor in the 3rd Round of the 1972 Amateur Draft and he would immediately go to the Central Hockey League Dallas Blackhawks for the 1972-73 season, playing in 39 games with four shutouts and a 2.75 GAA. Those numbers would get Veisor on the CHL's First All-Star Team, fewest goals against, and the Ken McKenzie Award for Rookie of the Year. Veisor was called up onto the Chicago Blackhawks for the 1973-74 season, where he would play 10 games, going 7-0-2 backing up the workhorse of Tony Esposito. Veisor was the second goalie of Jewish decent to play in the NHL, though he wanted to be first-- yet, he was beaten out a year earlier by Boston's Ross Brooks. That great debut didn't last for Veisor, as he went 1-5-1 in nine games with Chicago in the 1974-75 season, which would get him sent back to Dallas. In Dallas, he would play 16 games, bouncing back with an 11-5-0 record, then going 6-4 in ten playoff games. The 1975-76 season had Veisor back in Dallas, where he would get the starting gig and go 28-22-9 in 62 games with five shutouts. Again, Veisor would get CHL First All-Star Team honors and fewest goals against honors for the year. Veisor would stay in Dallas for the bulk of the 1976-77 season, playing in 40 games and compiling a 17-15-6 record, then going 0-2 in two playoff games. Also, Veisor would be called up for three games with Chicago, going 1-2-0. Veisor would be given another chance as the Chicago back-up to Tony Esposito for the 1977-78 season, playing in 12 games and going 3-4-5. It would get a bit better for Veisor in the 1978-79 season, playing in 17 games and having a 5-8-4 record, but the 1979-80 season had him going 3-5-3 in only 11 games. In June of 1980, the Blackhawks traded Veisor to the Hartford Whalers for a 2nd Round pick in the 1981 Draft. Veisor would play behind John Garrett in the 1980-81 season, appearing in 29 games with a 6-13-6 record. Veisor would only be in Hartford for 13 games in the 1981-82 season (5-5-2), as he was pushed out by the acquired Greg Millen. Veisor spent some of the 1981-82 season in Binghamton with the AHL team there, also named the Whalers; going 13-8-1 in 22 games. That was enough to have Veisor back in Hartford for the 1982-83 season, playing in 23 games, but with a dismal 5-16-1 record, as well as being a part of the Canadian World Championship team that spring, but never playing. The 1983-84 season was a well-traveled one for Veisor, starting in Hartford for only four games (1-3-0) before he was dealt to the Winnipeg Jets for Ed Staniowski. Veisor would first report to the AHL's Sherbrooke Jets, playing in five games with a 1-4-0 record before being called up to Winnipeg for eight games, posting a 4-1-2 record before he would hang up the pads. As last check-in, Veisor was the rink manager at Avon Old Farms School, an all-boys prep school in Avon, Connecticut. Being nicknamed "The Worm" because of his quickness and agility, Veisor never seemed to get his niche in the NHL right away. He was thrown into the minors and adjusted nicely to the style, but always was second-banana in the NHL couldn't break through. Even so, he was almost in on a history making situation for his heritage, if he could have only made it a year earlier. Scratch N' Win Arena in Edmonton? ?